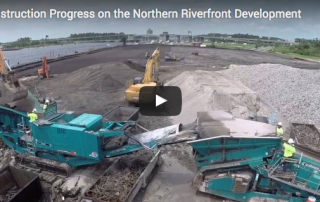 Docks for the Northern Riverfront Marina have started arriving in Wilmington. The crews are splashing the docks into the Cape Fear River and floating them across the river into our marina basin. The dock manufacturer's crew will begin assembling the dock sections in the next couple of weeks. The construction of the first phase concrete docks for our marina are almost complete. They will be arriving here in Wilmington at the end of the month. Thanks Eastern Floatation Systems, keep up the good work! Crews have started patching the existing holes and testing finishes on the concrete pier. Coastal Construction Crews are nearly done with the installation of the stormwater system on Harnett Street in Downtown Wilmington.